Roast ducks seem to be universally hung by the neck. A neat row of roast ducks in a display window looks the same and tastes comparable in Bangkok and in the US. Roast ducks are sold whole or in half. In the US, half a duck will set you back $7 while the whole duck is $15. In Thailand, a whole duck ranges from 400 baht to 700 baht, depending on whether it's a sidewalk vendor or a well known restaurant. With current exchange rate, that puts a duck in Thailand at $14 to $23. That's pretty expensive considering the minimum daily wage is 300 baht. When you're visiting Thailand, you have to try roast ducks. You'll find the ducks have less fat and more tender meat than US ducks. 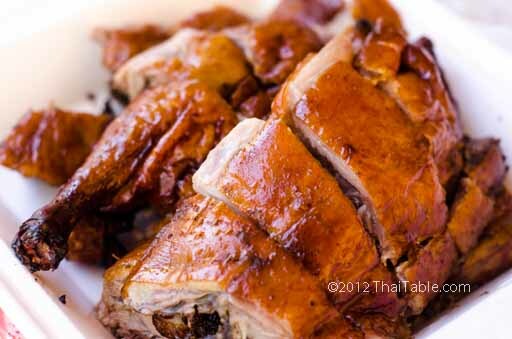 So, when I visit Thailand, a roast duck at MK Restaurant is on my to-eat list.